Acronym used by the NSA for Central Security Service. The CSS was established by presidential directive in 1972 to promote full partnership between the NSA and the Service Cryptologic Elements of the U.S. Armed Forces. This new command created a more unified cryptologic effort by combining NSA and CSS. The CSS comprises all U.S. military elements including the Army, Navy, Air Force and Marines and works to ensure a full partnership between the NSA and the military. The Director of NSA is dual-hatted as the Chief of CSS. 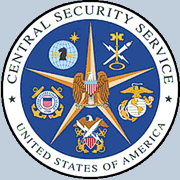 The blue background of the CSS emblem represents "fidelity" and "steadfastness", with the symbols for the cryptologic service elements provided shown clockwise from top right as follows: Army Intelligence and Security Command, United States Marine Corps, Naval Security Group, United States Coast Guard and Air Force Intelligence, Surveillance and Reconnaissance Agency with the symbol of the National Security Agency in the center.